Shenzhen Railway Station is located on the Hong Kong border in one of the city centers of Shenzhen, called Luohu District (罗湖区). The station mainly serves bullet C-trains between Shenzhen and Guangzhou, and normal-speed trains to other major cities in China. Shenzhen Railway Station is located in Luohu District, which is in the eastern part of Shenzhen. Luohu Port (to Hong Kong) is also located in this district. Get a free trial of our China Train Booking app to check the online China map anytime and anywhere. Shenzhen Railway Station mainly serves overnight normal-speed trains to major cities in China. If you are a budget traveler, the ticket prices are cheaper than for high-speed trains, and you can save a night’s hotel expense. Shenzhen to Guangzhou: There are 77 high-speed trains (C-trains) running from Shenzhen Railway Station to Guangzhou East / Guangzhou Railway Station from 06:12 to 22:31. It takes about 1 hour and costs 79.5 yuan per second-class seat. Shenzhen to Beijing: There are two normal-speed trains running from Shenzhen Railway Station to Beijing West Railway Station . It takes about 22–30 hours and costs 434.5 yuan per hard sleeper berth. Shenzhen to Shanghai: There is one normal-speed train running from Shenzhen Railway Station to Shanghai South Railway Station. It takes about 19 hours (16:00 to 11:00, +1) and costs 391 yuan per hard sleeper berth. Shenzhen to Xi’an: There are three normal-speed trains running from Shenzhen Railway Station to Xi'an Railway Station. It takes about 23–29 hours and costs 399–414 yuan per hard sleeper berth. Check all the China train online schedules and book your train tickets on our China Train Booking app now. 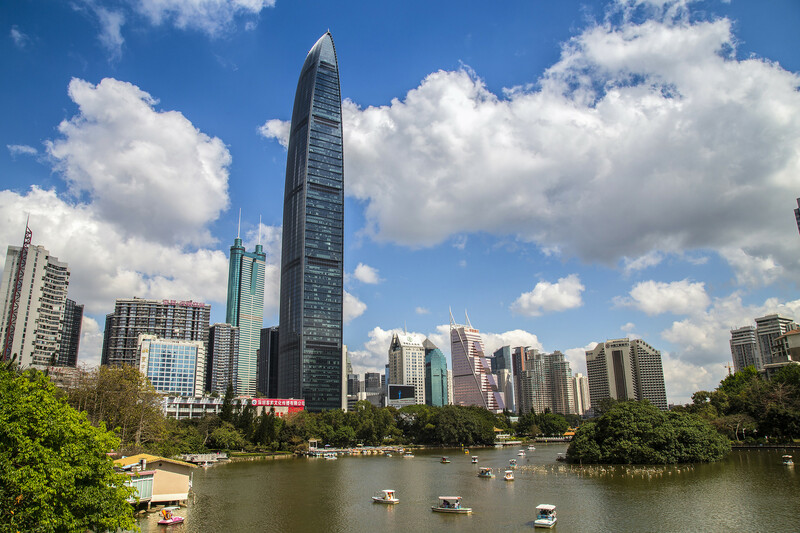 There are two subway stations near Shenzhen Railway Station: you can take Metro Line 1 at Luohu Station at the eastern side of Shenzhen Railway Station, and you can take Metro Line 9 at Renmin South Station at the northern side of Shenzhen Railway Station. If you are going to leave the station by Metro Line 1, go to B1 to reach Luohu Station. There are 35 bus lines distributed in the East and West Squares at Shenzhen Railway Station. Taxi stands can be found in both the East and West Squares at Shenzhen Railway Station. Fare: 10 yuan for the first 2 kilometers and 2.5 yuan per extra kilometer. For nighttime journeys (23:00 to 06:00), a 30% extra service fee is charged. Baggage fee: For baggage that is over 20 kg in weight and 0.2 m³ in volume, 0.5 yuan will be charged for each item. There are two long-distance coach stations near Shenzhen Railway Station: Luohu Long-Distance Bus Station and Qiaoshe Long-Distance Bus Station. 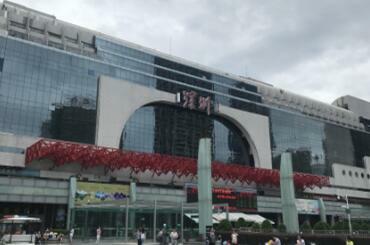 Location: It’s located to the southeast of Shenzhen Railway Station, at Exit A in Luohu Station (Metro Line 1). Mainly goes to: It serves trans-provincial buses to Guangxi (Nanning, Guilin, Liuzhou, Qinzhou, Beihai, and Wuzhou) and Fujian Province (Lianjiang, Fuzhou, Putian, Yongchun, Shishan, Quanzhou, Shishi, Jinjing, Jinjiang, Xiamen, and Zhangzhou). It serves inner-provincial buses to Zhuhai, Huadu, Shunde, Jieyang, Chaozhou, Maoming, and Zhanjiang, among others. Get a one-to-one free consultation by sending us a question via our China Train Booking app! >>> By taxi: This journey takes about 40 minutes and costs about 50 yuan. 1. Take Metro Line 1 at Luohu Station and get off after seven stops at Convention and Exhibition Center Station (会展中心). 2. Take an internal transfer at Metro Line 4 and get off after seven stops at Shenzhen North Railway Station. >>> By taxi: This journey takes about 25 minutes and costs about 30 yuan. 1. Take Metro Line 1 at Luohu Station and get off at Shopping Park Station (购物公园). 2. Leave the station from Exit A. >>> By taxi: This journey takes about 1 hour and costs about 130 yuan. 1. Take Metro Line 1 at Luohu Station and get off after 10 stops at Chegongmiao Station (车公庙). 2. Take an internal transfer at Metro Line 11 and get off after seven stops at Airport Station (机场站). 3. Leave the station from Exit C.
Passengers can get to Hong Kong direct via Luohu Port near Shenzhen Railway Station. The distance from the station to the port is less than 500 meters. 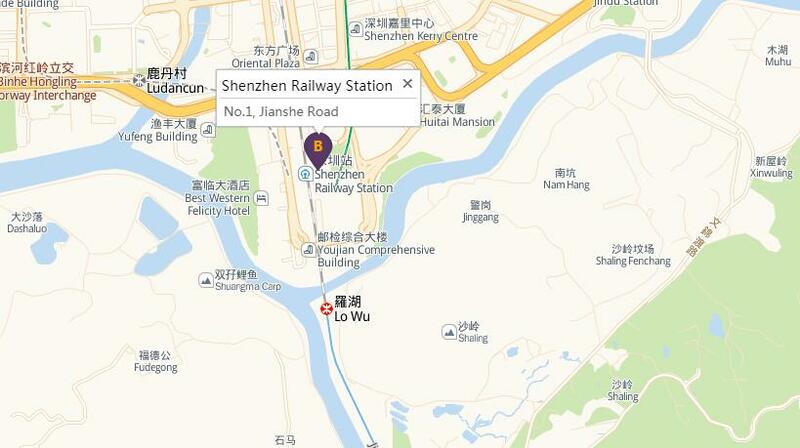 Check the online China map on our China Train Booking app anytime and anywhere! Further reading: Five Ways to Get to Hong Kong from Shenzhen. Although you can take East Rail Line at Luohu Station (near Shenzhen Railway Station) to reach Hong Kong, we don’t recommend this because you need to transfer four times to get to the airport. 1. Take a taxi from Shenzhen Railway Station to Huanggang Port. It takes about 20 minutes and costs about 70 yuan. 2. Pass through the port with the necessary documents. 3. After you pass through the port, there are business cars with seven seats operating directly to Hong Kong International Airport. The price is about 120–180 yuan per person. 1. 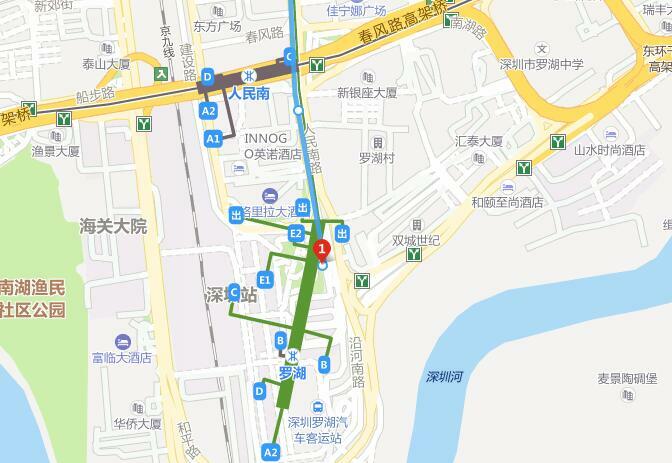 Go to Luohu Port from Shenzhen Railway Station (about 3 minutes’ walk). 2. 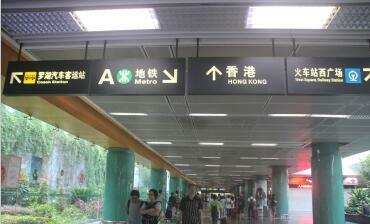 After you go through the port, walk to Hong Kong Hung Hom Railway Station (about 5 minutes’ walk). 3. Take East Rail Line (东铁线) and get off at Sheung Shui Station (上水站). 4. Go to Sheung Shui Plaza (上水广场) and take Express A43 to reach the airport. 7 Days Inn: It costs 99 to 310 yuan per night and is only 230 meters away from Shenzhen Railway Station. The hotel’s facilities may be a little bit old. Huizhange Hotel (Chinese: 深圳汇展阁酒店): It costs 200 to 300 yuan per night and is only 490 meters away from Shenzhen Railway Station. It offers a taxi calling service, is fairly clean, and is comfortable. Century Plaza Hotel (深圳新都酒店): It costs 400 to 800 yuan per night and is 670 meters away from Shenzhen Railway Station. It offers an airport/station pick-up service, a spa, and KTV. Shangri-La Hotel: It costs 900 to 1,800 yuan per night and is 440 meters away from Shenzhen Railway Station. It offers a buffet breakfast, airport/station pick-up service, a taxi calling service, an outdoor pool, a gym, a massage room, and a sauna room. You are welcome to book your China train tickets on our China Train Booking app and get them within 3 minutes. We also provide a door-to-door delivery service and one-to-one free travel consultation. Discover how to buy/book a China train ticket: How to Buy a China Train Ticket .